We are delighted that 52 members and friends enjoyed our NFA sponsored River Cruise to Holland. The tulips at the Keunkenhof Garden, which is open only 8 weeks each year, were at their spectacular best. Thanks to Mary Ann Bryant a visit to the major world wholesale market where all the bidding for flowers takes place was indeed an eye opener for all of us. Our final day found 26 of us, guests of international designer Joan Stam in his studio outside of Amsterdam. His planned workshop introduced members to 4 innovative designs, creating a fun time for all to take part and share our own expertise with each other. It is always a pleasure meeting with the NFA board, sharing ideas and our exciting plans for the future. NFAs long established tradition of bring outstanding national & international design speakers to our members and guests is a continuing endeavor. The expansion of the NFA website is part of future plans. Giving invited guest designers an opportunity to share their talents with those viewing the website is one of several new NFAs future plans. Tentative plans are in the works for our next NFA trip/tour to Provence, France. Look for further details on website and upcoming newsletters. With this tradition in mind we invite everyone to the NGC Fall Board meeting in Orlando, FL to NFAs design/dinner featuring design speaker Penny Decker, “Magical Visions of India”, on Wednesday, September 26, 2018. Flyers are available online or in this newsletter. 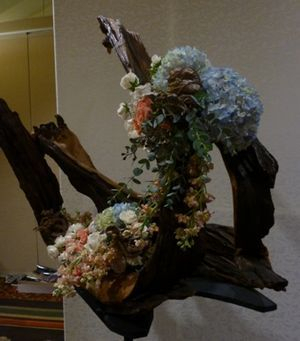 Our very own Arabella Dane was the WAFA person at the World Flower Show in Barbados. You may view the designs photographed by Arabella on our NFA website. A special thank you for the outstanding photos and informative report. 2nd Vice President and Membership Chairman.